Whenever the show “Eat Street” is shown on the National Geographic Channel, my appetite for a Sloppy Joe shoots up incrementally and I rush to google the many methods for me to replicate the dish for myself. However, realistically, I know that my endeavours to make my own Sloppy Joe will only stop at googling for recipes online. So, when I heard about the new burger joint, Blink Burgers, and saw the mouth-watering pictures of burgers and tacos offered there, I made a beeline for their shop located in Bedok North. 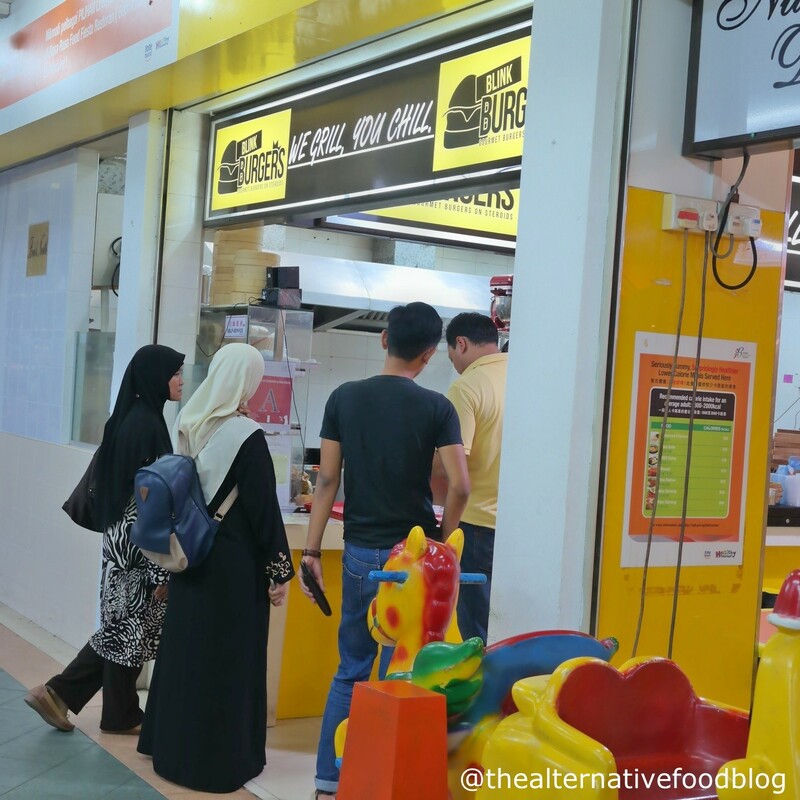 According to its Facebook page, Blink Burgers is a Halal-certified gourmet burger joint that offers five different burgers as its permanent mains, with the occasional “Chef’s Specials” that changes from time to time. I decided to give Blink Burgers a try on a recent Sunday afternoon. It was not difficult to locate Block 537 as we entered Bedok North Street 3. Whether you are going there by car or by foot, just look out for New Hawa Restaurant and you can find Blink Burgers nestled at the corner of the coffee shop. Upon studying its menu, I realised that there were only five mains offered, all of which are burgers. 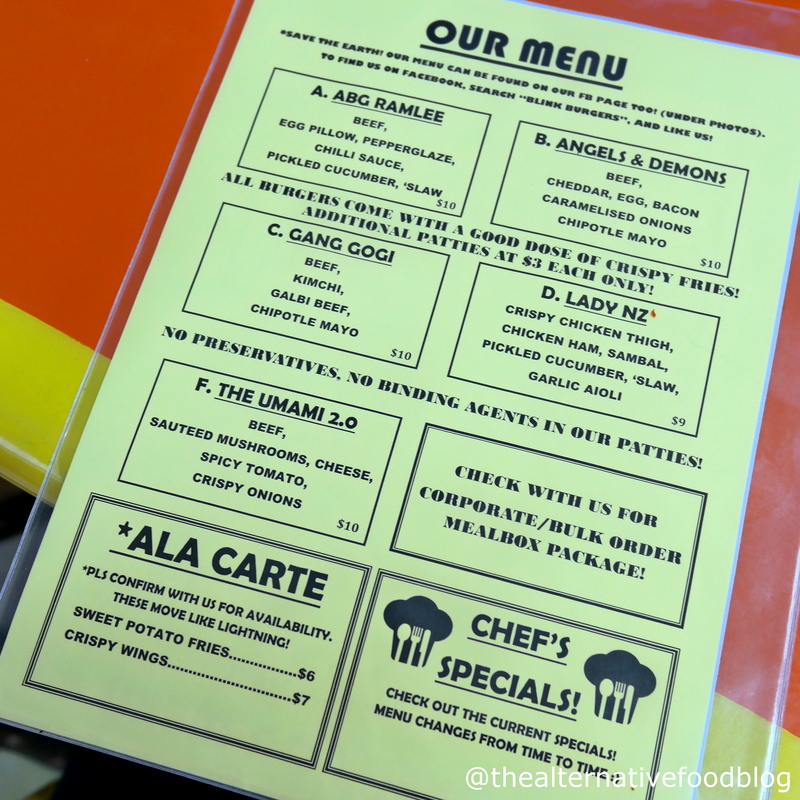 As you can see from its menu below, interesting names are given to each of its burgers such as the Abg Ramlee (perhaps paying a homage to both the classic Ramlee burger and Ramli Sarip, the renowned Singaporean rocker), The Umami 2.0 and Gang Gogi. Almost all of its burgers, which come with a side of regular fries and chilli sauce, cost $10 each, with the exception of Lady NZ, which costs $9. My sister decided to try Angels and Demons, a burger that consists of a medley of beef, cheddar cheese, egg and bacon, topped with caramelised onions and chipotle mayonnaise (SGD $10). On the other hand, I decided to try the The Umami 2.0 (SGD $10) which contains sautéed mushrooms, cheese, spicy tomato and crispy onions. In general, we both felt that the burgers, for what we paid for, were just satisfactory. They were not at all bad, but I felt that further improvements could be made to make the burger worth paying for. While I liked how the buns were slightly toasted and therefore added a nice crunch to the entire burger, I felt that the patty and the relish could be enhanced further. The patties, though they were thick, had a relatively dry texture that disintegrated easily into smaller chunks of ground meat when I tried to take a bite. In addition, the patties tasted rather bland, and I wished that there was more seasoning added, since they are the main “stars” of the show. Being a big fan of burgers, I always feel that what enhances a burger is the relish that come with the burger. In this case however, I felt that the relish did not help to enhance the patties. In The Umami 2.0, I was expecting a distinctive crunch from the “crispy onion” that was listed in the burger description. But to my disappointment, only two of what seemed like onion rings were placed in the burger and sadly, it did little to enhance the flavour of the patties. I feel that the burgers would taste better if a more substantial amount of each relish is included in the burger as the relishes help to provide distinctive characters to the different burgers. Otherwise, the burgers offered by Blink Burgers would taste somewhat similar, as is the case of my first dining experience there. 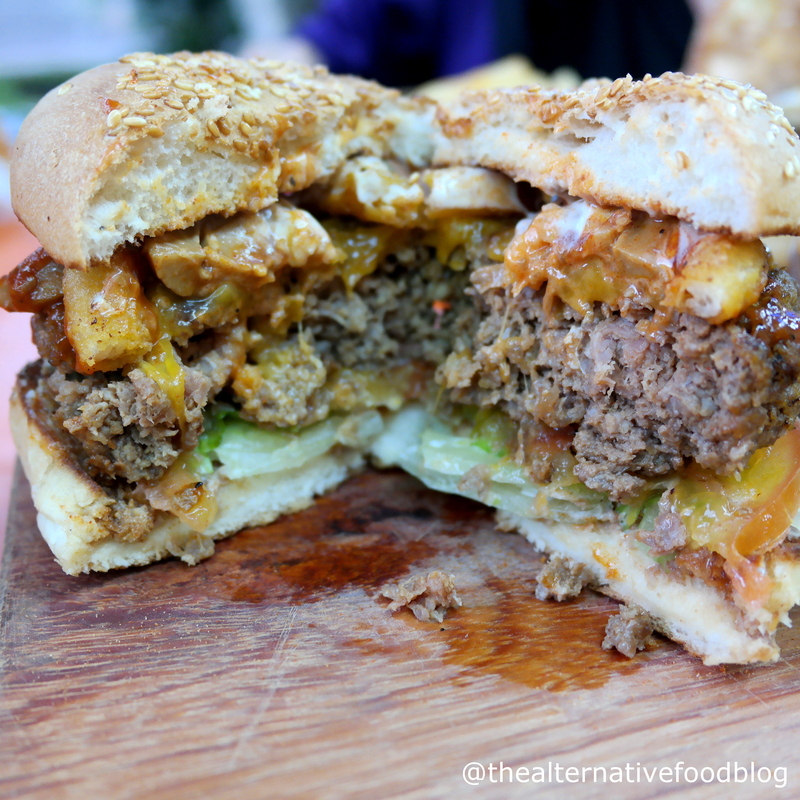 The Angels and Demons is a beef burger that is served with a chipotle mayonnaise but sadly I felt that the taste of the chipotle mayonnaise was not distinctive and was more mayonnaise than chipotle. Unfortunately, the combination of eggs, bacon and onions were overpowered by the bland taste of the beef patty. Perhaps, if the relish had a greater punch or if the patties were made more compact and juicier, this combination would have been a greater hit with me. Unlike Angels and Demons, I feel that The Umami 2.0 fared better in terms of how the various elements of the dish were married together. As you can see from a close-up picture of the cross-section of the burger, the sautéed mushrooms that were meshed together with the oozing cheese complemented the patty favourably and added a juiciness that was missing from Angels and Demons. However, I do feel that if more crispy onions were added, it would give the burger an added layer of crunch. Despite the average faring, I do give credit to the chefs of Blink Burgers for the unique presentation of their burgers. For a start, the size of each burger is not as big as those we get from our fast food restaurants. Each bun is the size of an average woman’s fist, although the entire burger is amped up in terms of height by the thick patty. 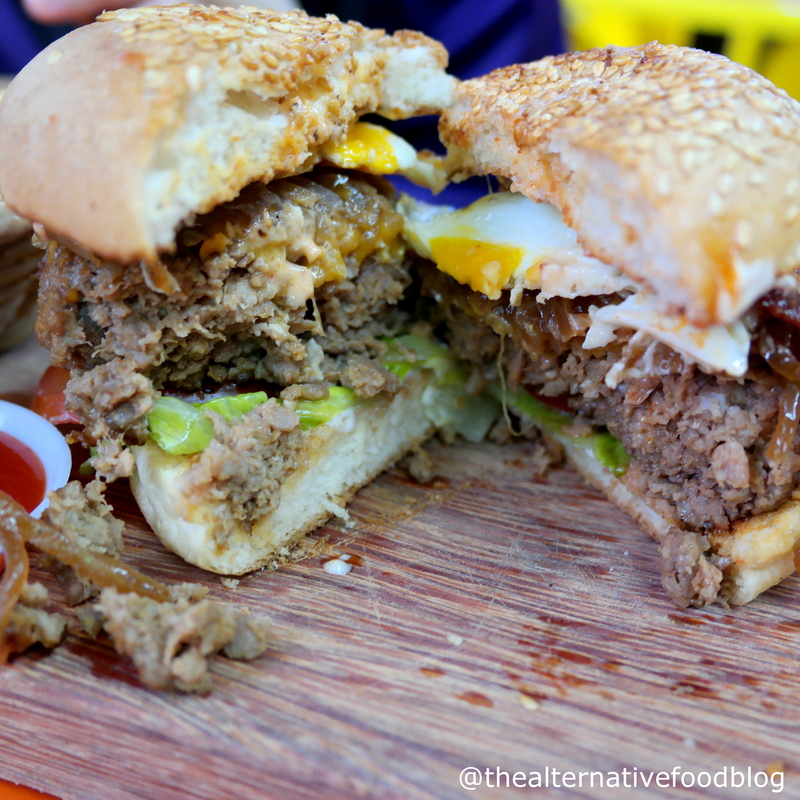 The burger is served with a knife that is plunged into the burger, perhaps to prevent the burger from falling apart on a wooden board that gives it a more rustic and less formal dining atmosphere. The regular fries that are served as sides to each burger are also seasoned with a hint of salt and chilli powder that adds spiciness to the crunchy fries. 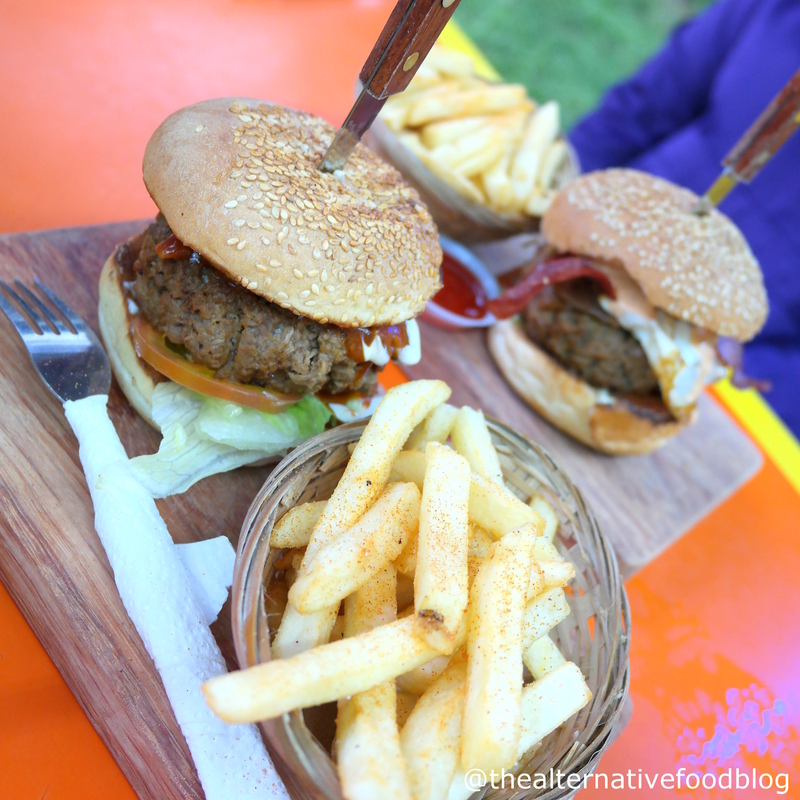 For diners who are also burger lovers, do give Burger Blinks a try, as I do feel that the combination of flavours that they try to concoct for their burgers are unique and not something that you would find at your average burger joint, halal or otherwise. Do check out their Facebook page for regular updates on their Chef’s Specials that lasts for a limited time only. Our Ratings: ♡ ♡ ♡ / ♡ ♡ ♡ ♡ ♡ (3 out of 5 hearts). 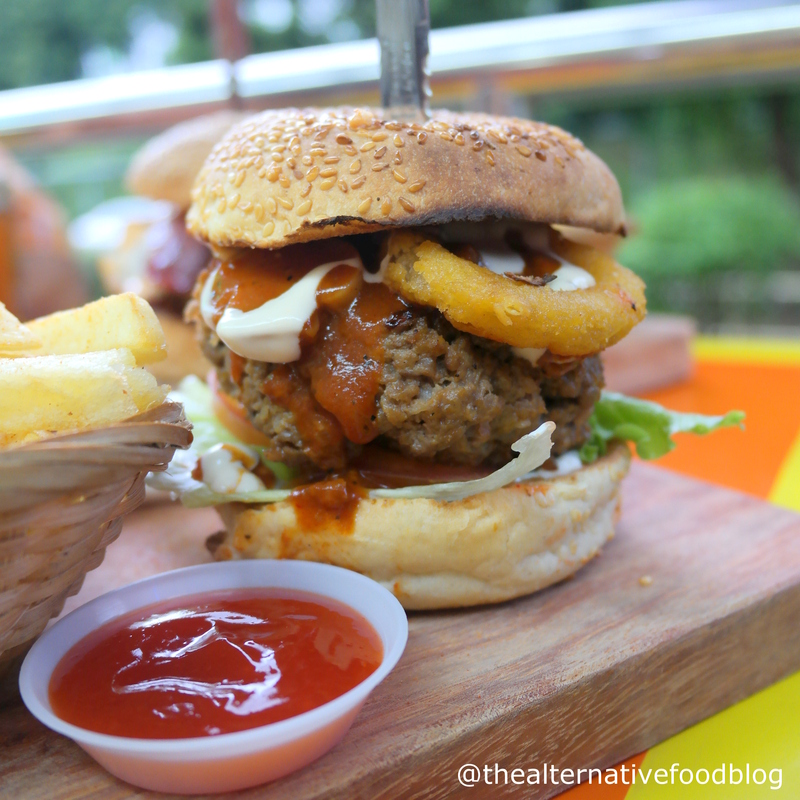 This review was written by our guest reviewer Nur Khairunnisa Johari, who reviewed Blink Burgers with her sister.